I just got a 2007 400h. The master light for tire system is on. I checked them all and they are at like 40 psi, that is high. Would this trigger the system? Just got from small car lot. 50 miles out the check system light came on. Also the gas MPG was trading 16 mpg. Really low for a hybrid. What would cause this? Not under warranty used 144,000 miles at present. Want to return if it’s a larger issue any suggestions? I checked all the tires pressure. Also pressed the tire system code button under the steering wheel. I just got it yesterday. I may return it as the mpg is way low making me fear something else is amiss. I am looking it over myself yes. Not near a dealer and it’s Sunday. Hey there, Jake here.Thanks for the question.If the TPMS tire warning is on, it’s detecting either a pressure being low or a fault with the system.You can try to let about 3 psi out of each tire, but 40 psi should not cause a warning.For the MPG, start be resetting the MPG average learning and starting it over to see if it’s accurate. If it is that low then I’d be concerned. I talked to the dealer and they will take it back for a $400 charge. But with that low of mileage I am yes concerned about the bigger picture for a hybrid system. I am not a mechanic. Nor do I want to become one. What would cause the gas mileage to be so low? The gas mileage issue could be a fault with the hybrid system or the engine itself (poor fuel control due to MAF operation etc) its hard to know exactly without first hooking up a scan tool. Yea, that’s pretty unfortunate.Most dealers will work with you when it’s that new. Toyota (which Lexus IS made by) makes good hybrid vehicles.I personally think only significant advantage to a hybrid is on the economy cars. It’s far less noticeable on the larger vehicles. That is what I am gathering from my research. The fella is going to look it over really well again and I am going tover see if I can find someone local who has a better scanner to also check it out independently. The dealer said they would fix it free but I want to make sure it’s the right issues that get resolved. Last thing I need is a lemon. Sounds like your doing the right thing. I got these reads two different code readers.....what is the cost? To fix these two things? It was the MAF and the ignition coil. Both will help a lot with the performance. 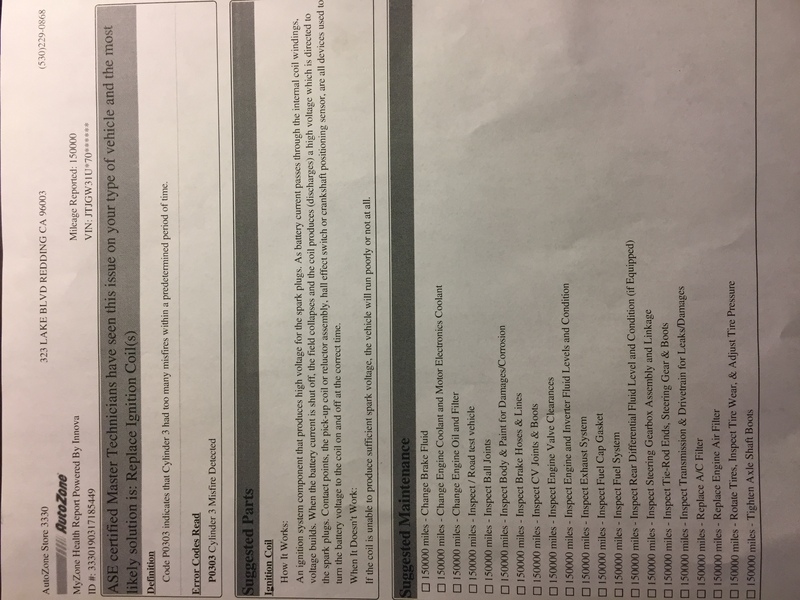 I sent them to the dealer and that ways there is a time and date for the readings that I can give the finance company too stop the sale if they won’t help me fix it. They want to charge me a $400 restock fee to return the car. But it had things that needed repair and wasn’t disclosed and the codes were obviously cleared so it wouldn’t be on when they sold it to me. PS thanks you for the support. My brother a Harley mechanic was killed 3 years ago on his bike, so my go to guy is gone for times like this. I just don’t want to get screwed over. The combination of P0303 and the bank 1 lean shift tells me there is most likely an air leak at cylinder 3. 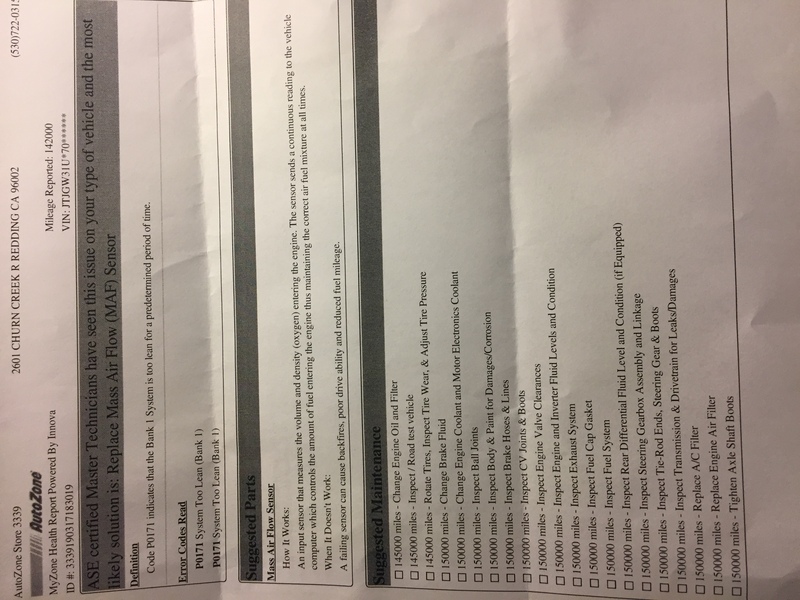 That could cause BOTH codes.I don’t think replacing the MAF or the ignition coil would fix the problem.If the scan tool shows large fuel corrections on BOTH banks then I would be more inclined to fault the MAF, bit just a bank 1 lean shift and a misfire makes me think leak at the intake manifold gasket.Also, very sorry about your brother. Losing any family is hard. Especially in an unexpected accident. Is that return the vehicle kinda thing and move on? unless they will fix it for free, it's not a do it yourself job to pull the intake manifold. It would probably run you another $400 to get it repaired. I know , I paid $8900 at closing and truly can’t afford major incidents. I am calling the loan company hold the financing till I can see what the dealer is willing to do. I can’t have issues like this 50 mikes out the lot. certainly not! Seems like you have a plan. Have "check hybrid drive" and "check vac" on lexus 400h.